Dearly departed’s photo reproduced on Italian Ceramic. Extra – Cross and/or Angels if required. Manufactured in Midnight Star Black Indian Granite is currently under Catalogue special. Identical sets in stock with Raised Top Cover Slab. Similar sets in stock with Flat Overlapping Top Cover Slab. Prices quoted will be sustained for existing stock only. Already installed in the Armenian section of the Springvale Botanical Cemetery. Installed for SARKISSIAN, Springvale Cemetery. Please click on the ‘SARKISSIAN’ image to view full details of installed monument. 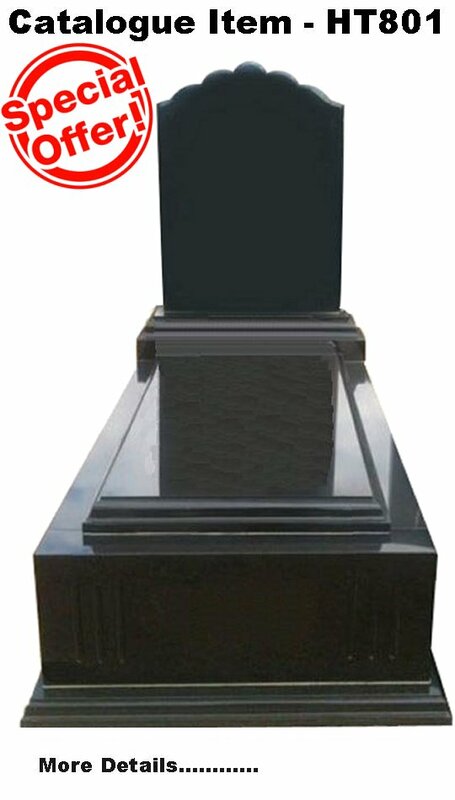 Using only quality Indian granite, directly imported from our exclusive supplier, the above granite headstone over full monument has been hand crafted by skilled stone masons. This entry was posted in Catalouge and Stock Items, Full Monuments and tagged Catalogue Special, Cemetery Memorial, Full Monument, HT211, Midnightstar Black Indian Granite, Sarkassian, Springvale Botanical Cemetery. Bookmark the permalink.